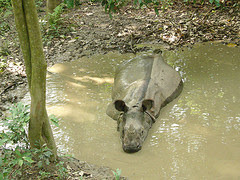 Near the border of India in Southern Nepal sits a National Park called Royal Chitwan. 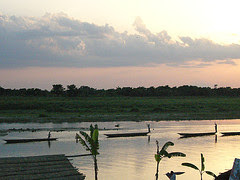 It's home to numerous wildlife including bears, tigers, elephants, rhinocerous, alligators and monkeys. On our first day in the park we spent a few hours hiking through the jungle. Even with our guide, we both felt uneasy. When hiking back in the States, I have a pretty clear idea of what to do if I come across a grizzly or black bear. But coming across a fricken TIGER is another thing entirely. So, we're walking along when all of a sudden our guide stops us out of nowhere and motions for us to shut the hell up. Believing the animal in question was probably a spotted deer or a monkey, we leisurely stopped in our tracks. It was at this point that our seasoned guide turned and mouthed a word that you might want to hear if you were in a jeep, or a helicopter perhaps. As we looked at each other in terror, it was obvious that both of our hearts were pounding. I then acted as any man would given the same situation. I picked up a stick. Then we heard it. A spine shivering GROWL that was as haunting as it was close. In a blaze of unadulterated fear, Kari and I turned and ran faster than we ever have in our lives, taking shelter behind tree that measured six inches in diameter. After noticing that our guide hadn't moved a muscle and realizing that being on our own was probably the worst decision we could make, we slowly headed back to the safe presence of our five-foot, three-inch guide. And in another moment, the animal was gone. While our hearts began pumping at a more relaxed pace, our guide simply laughed at us. Within a few hours, we were back in the safety of our jungle bungalow, with the hotel pet keeping watch just five feet from our door. A ten thousand pound elephant. Hey you two. Couldn't comment on the last entry so I'm going back to this one to say oooh! Atlas Shrugged! One of my favorite books. And also that you must be very speedy readers. That one took me like 4 months.